According to the latest report, Chinese President Xi Jinping will hold an unprecedented informal meeting with Indian Prime Minister Narendra Modi on April 27-28 in Wuhan, capital of central China's Hubei Province. Prime Minister Modi will be flying straight to Wuhan, and the two leaders are expected to get into a huddle immediately after he lands on the afternoon of April 27. He is expected to have another session with Xi on the morning of April 28, and return the same afternoon. This kind of informal meetings between the nations, provide a chance to gain a better understanding of each other’s concerns and place in the world and the region. Also, there is no pressure or expectation to reach any immediate results, and agreements are not placed on the anvil. Chinese State Councilor and Foreign Minister Wang Yi, called the two nations (India & China) "natural cooperation partners" and their common interests far outweigh their disputes. "It is an inevitable choice of the two countries to stick to long-term friendship, mutually beneficial cooperation and common development. ", he added. 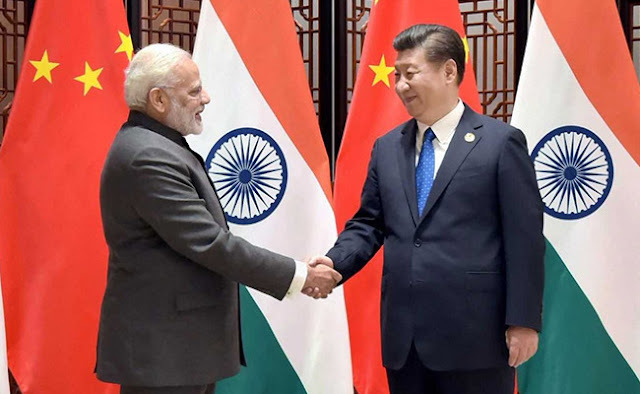 Prime Minister Modi and President Xi are also expected to discuss long-standing issues like India’s membership to the Nuclear Suppliers Group and China blocking efforts at the United Nations to list terror group Jaish-e-Mohammed chief Masood Azhar as a global terrorist. Bilateral ties between India and China have also soured because of the China-Pakistan Economic Corridor which passes through Pakistan-occupied Kashmir, which is an integral part of India. Also, in August last year, India and China ended a 73-day standoff between their troops in Doka La. The standoff had strained ties considerably between the two countries. External Affairs Sushma Swaraj and Defence Minister Nirmala Sitharaman are in Beijing to attend the Shanghai Cooperation Organisation (SCO) Summit 2018. The two senior ministers from India also held meetings on April 23 with their counterparts in two different sessions. In her address to the SCO Council of Foreign Ministers meeting, Swaraj said that peace in war-torn Afghanistan could be achieved through political dialogue and reconciliation in an atmosphere free from terror and violence, within the framework of Afghan Constitution. She also said that the fight against terrorism should not only seek to eliminate terrorists but should also identify and take action stringent against countries that sponsor them and encourage them by providing safe havens. Addressing the SCO Council of Defence Ministers’ meeting in Beijing, Sitharaman raised issues of cross-border terrorism, extremism, cybersecurity and narcotics trafficking, saying international terrorism is today the most serious threat to the peaceful societies. Prior to SCO meet, on April 13, India's National Security Advisor Ajit Doval held talks with the Yang Jiechi, the Director of the Office of Foreign Affairs of the Communist Party of China in Shanghai during which both sides agreed to maintain the pace of high-level exchanges after last year’s border stand-off. However, on April 24, India's name was conspicuously missing in the joint communique by the member countries of the Shanghai Cooperation Summit (SCO) supporting China's One Belt, One Road (OBOR) project. On June 8-9, 2017 in Astana, India, and Pakistan were admitted into the SCO. "The foreign ministers of Kazakhstan, Kyrgyzstan, Pakistan, Russia, Tajikistan, and Uzbekistan reiterated their support for the 'Belt and Road Initiative' proposed by China," said a joint statement issued by SCO Foreign Ministers at the end of their one-day meeting. 1. On April 4, 2018, India's Defence Minister Nirmala Sitharaman on Wednesday met her Chinese counterpart Wei Fenghe on the sidelines of an international security conference in Moscow. 2. Talks were held between Ajit Doval, India's National Security Advisor and Yang Jiechi, the Director of the Office of Foreign Affairs of the Communist Party of China in Shanghai on April 13, 2018. 3. On April 23, 2018, India's External Affairs Minister Sushma Swaraj met Chinese Vice President Wang Qishan to discuss ways to strengthen India-China bilateral ties. 4. India's External Affairs Sushma Swaraj is paying a visit to Mongolia from April 25 to 26. It's a scheduled trip, on her way back from China. 5. Xi-Modi informal meeting from April 27 to 28 in Wuhan, Hubei Province.